A New Jersey couple is under arrest after they left their three children outside in a car for almost two hours while they went inside to gamble at a Bensalem casino. 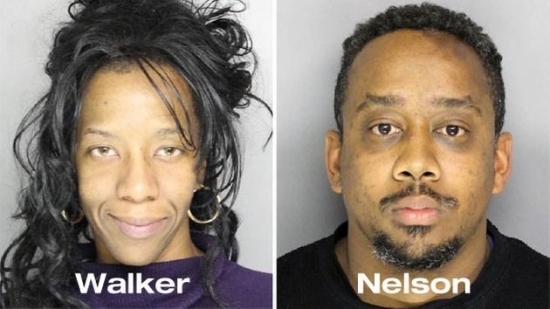 39-year-old Jarrett Evan Nelson and 30-year-old Ebony Walker of Newark, NJ, are charged with endangering the welfare of children and recklessly endangering another person. Police were called to Parx Casino around 9 p.m. on Saturday night after a patron saw the kids in the car. The three children, ages 1, 3, and 8, were found alone in the cold vehicle. Using surveillance video, casino security was able to determine they had been left out there for 1 hour and 38 minutes. They were also able to track down the parents inside the casino. The children were checked out at the hospital and released to their grandparents unharmed. Nelson and Walker were arraigned and sent to Bucks County Correctional Facility in lieu of $50,000 bail, 10 percent. Philadelphia's 99th mayor, Jim Kenney, was inaugurated this morning at a ceremony held at the Academy of Music on South Broad Street. Also sworn in, were judges, city council members, and row officers. Mayor Kenney's brief speech touched on goals including education, minimum wages, jobs for returning convicts, criminal justice reform, and poverty. After the ceremony, they walked the few blocks north to City Hall to get work. Kenney signed a number of Executive Orders on the first day. The first 5 dealt with the creation of various offices and officers that report to the mayor including the Chief Diversity and Inclusion Officer, Chief Integrity Officer, Office of Planning and Development, and Chief Administrative Officer. The final order “states that city authorities will not cooperate with US Immigration and Customs Enforcement (ICE) detainer requests for undocumented citizens who are arrested and would have otherwise been released from custody, unless the individual has committed a first or second degree felony involving violence.” This order rescinds an order that Mayor Nutter put into place at the end of 2015 that would have had authorities cooperating with ICE. An autopsy was performed today on 5-year-old Jayliel Vega of Allentown who went missing on New Year's Eve from a relative's home. The coroner reports that there are no injuries to the boy, but that more testing is needed to determine the cause and manner of death. Vega, who is autistic, disappeared from the holiday party around 11 p.m. on Thursday prompting a massive search effort for the special needs child. His body was found on Saturday in a canal about a quarter mile from his great aunt's home. Police are treating this as a tragic accident. The coroner said, "The cause and manner of death is pending the completion of the investigation and forensic testing." Clear skies, temperatures around 20, wind chills around 7 this evening in Center City.